Everywhere I turn someone asks me, “Are you ready for Christmas?” I don’t even have the energy to laugh. Nothing is “finished” in the way that it once would have been. Of course none of us will do what Mary did on the first Christmas. 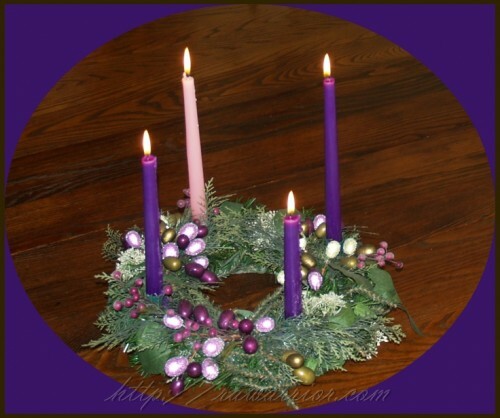 However, I am determined to say with Mary, “Be it unto me as the Lord wills.” That night in the stable was the ultimate, make-the-best-of-it story, wasn’t it? ← Is there a cure for Rheumatoid Arthritis? Merry Christmas Kelly – My husband and I were talking this morning about all that is not done; due to his working in another city and my RA flare. About how our circumstances have made any celebration an event where we all have to work together and the unnecessary is eliminated while we learn to discern what is really meaningful. I guess today I see that as discerning God’s will; not that it is God’s will that I live in pain (of course) but that it is God’s will that I focus on what has meaning, as opposed to what is meaningless fluff. Like most RA’ers I was a type A, everything about the holidays must be perfect and I will do it all type before I get sick. So, a little bit of predisone, an infusion of Orencia and I will do what I can. One gift I want to give is the gift of presence, one gift I want to celebrate is the gift of being alive. I’ve been lurking at your blog for a while now, it has given me hope and focus as I try to come to acceptance and peace with RA and the changes my illness has meant to my life. Blessings to you and yours for this year. I love your “gifts”. Thank you for sharing. This year our Christmas isn’t as big as most in the past, but it doesn’t change what in our hearts. I haven’t put up much outside this year, compared to past years, due mainly to just not feeling like it. As much as I like to say that I’m not going to let RA control my life … it does. I’m just not handing over full control, at least not yet. I am wishing a blessed Christmas to all the warriors on this site and through out the world. “Love is what’s in the room with you at Christmas if you stop opening presents and listen.” (Bobby – age 7) To Kelly and to all friends of RA Warrior: May you know God’s love for you this Christmas, and be surrounded by the love of family and friends. Merry Christmas! I was so excited to find this site today, this was my first Christmas dealing with full blown RA and the treatment. I started last year at Christmas but was not diagnosed until April. I had to scale back on everything I normally did including the tree. We put up a small tree on the table and dinner was done at my daughters. I was still exhausted and am trying to recover just from the travels and extra people in and out. The true meaning was that we were all together as a family and less was put on the material things. Thank you, Kim. Welcome to the site. I discovered Christmas is still Christmas even without a perfectly clean house and a dozen different kinds of cookies. One thing we do now that my husband has RA is put all of his presents and the ones he wraps in gift bags. It makes opening presents less painful and hopefully more enjoyable.